Amy Houlston at Burgess contacts me with news of another motor yacht new to the market as Trinity’s 43.2m Big Zip is listed for sale in a joint central agency with Buddy Haack at White Knight Yacht Sales. Designed by Trinity’s in-house design team and built in 2010, Big Zip boasts sophisticated and classic exterior lines while her premium quality Evan Marshall interior creates a warm and inviting atmosphere. Big Zip provides spacious and luxurious accommodation for 10 guests in five cabins and offers a flexible arrangement with the idea of charter guests in mind. The master suite, located on the main deck, is decorated with rich cherry woods and fine silk fabrics and comes fully equipped with a private study, his and hers bathrooms and a Jacuzzi bath. The lower deck holds three well appointed king staterooms and one generous sized twin guest stateroom. The main saloon gives ample amounts of natural light with its low-sill windows while its overheads boast plenty of lighting fixtures making it the perfect place to entertain day or night. Guests can enjoy the crisp night air while dining on the aft deck before retiring to the skylounge bar for after dinner cocktails. 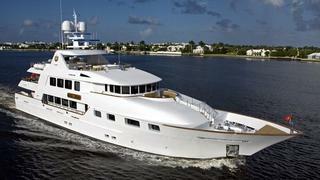 ABS classed and MCA compliant, Big Zip is available to view at the Fort Lauderdale show asking $24 million.